← NABUCCO at the Grand Theatre de Geneve: Elizabeth Blancke-Biggs shines as Abigaille. Wozzeck is the only opera Alban Berg ever completed. This production was mounted in 2009 as a joint production with the Bavarian State Opera. The production was directed by Andreas Kriegenburg, who also directed the production of Rigoletto which opens the season. 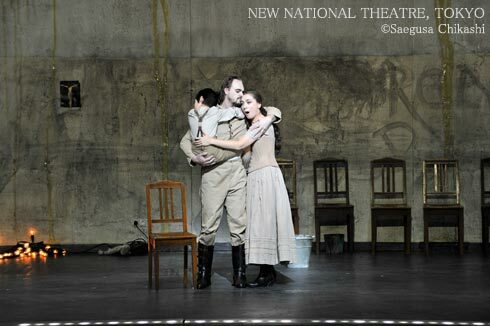 Kriegenburg’s Wozzeck offers a biting depiction of the way that widespread poverty and violence can link one generation to the next in a society. Conducting will be Günter Neuhold. The title role will be sung by George Nigl, a baritone who maintains an active international performance schedule. Marie will be sung by Elena Zhidkova, with whom audiences should be familiar thanks to her appearances in past NNTT opera productions. This entry was posted in Music, OPera and tagged Alban Berg, Andreas Kriegenburg, Bavarian State Opera, Tokyo Philharmonic Orchestra, Wozzeck. Bookmark the permalink.